Reliable Power: JCC has only one power line entering the building. As you may know, the AC power delivered by the utility is a shared resource used by all utility customers. It experiences the effects caused by everybody using that power simultaneously. For instance, starting any motor such as a refrigerator compressor will cause large “spikes” on the line. Utilities are not required to even out those spikes because the cost of doing so would be prohibitive. These spikes can and do damage power supplies. JCC uses a device called a UPS that accepts the utility power, converts it to direct current and uses that to charge a large bank of batteries (the cabinet is about 5 feet high and 3 feet wide by 4 feet in depth. Incoming utility power is converted to DC and charges the batteries. The batteries are then used for power for all computer equipment in the building by running the DC current through an inverter to provide AC. The result is a very clean power supply to all computers and results in much higher reliability for power supplies and other delicate electronic circuits. In the graph on this page, the erratic blue line displays power coming into the UPS. 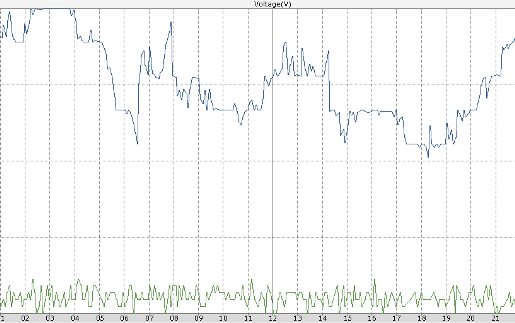 The green line shows the much cleaner AC power coming out of the UPS and being delivered to our data center. The data in this graph is over a 24-hour period and represents a typical day. It is easy to see the benefit of extended lifespan for our electronic equipment. The batteries can supply sufficient power to keep all computers running for about 15 minutes. The batteries are sized to allow one or more to fail. The remaining can do the work, albeit for a shorter time. Battery health is monitored continuously. Should utility power be interrupted, this is detected by something called a transfer switch. After the interruption the switch waits for a minute or two and then activates a generator that will power the entire office. This generator runs on natural gas which is supplied by the gas utility and we therefore consider it essentially inexhaustible. The generator takes the place of utility power until power is restored. During the most recent extended power outage in late June through early July, 2012, JCC’s systems remained running and our office was even air-conditioned as the generator is sized for powering the entire office. JCC was up and our internet connections were secure and running for the entire outage.